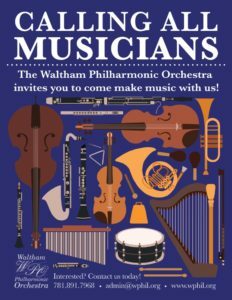 If you love making music in groups and enjoying the camaraderie of fellow musicians, the Waltham Philharmonic Orchestra is for you! Now starting our 31st season, the WPO is the community orchestra that is Waltham’s longest-running classical music organization. We pride ourselves on high-quality performances and a friendly and welcoming atmosphere. The WPO is a non-audition orchestra that performs a great mix of beloved standard pieces and more challenging, creative programming. Our award-winning Music Director, Michael Korn, sets a standard in which our musicians push the envelope of their talents, yet have a very satisfying experience and sense of accomplishment after every concert. In addition to the orchestra, we form chamber groups that perform at various functions throughout the city. We care about our musicians, foster a congenial atmosphere, and even have complimentary refreshments at rehearsals. Come and check us out; we’ll be happy to discuss our upcoming season and how you can become a part of the best classical performances to be found in Waltham and the surrounding MetroWest area.